Pantone, the color authority in the design industry, has chosen bold colors the last few years as their Color of the Year. After years of bright reddish orange, hot pink, luxe turquoise, and an inexplicable sort of bright mustard yellow (a color that flatters only .0001% of the population of any given country), this year's shade, Emerald, is actually wearable. The jewel tone is at once bold, bright, and earthy, and lends itself to home design easily. With a neutral color scheme, a pop of Emerald brings in an element of dignified, but fun, color. Here are a few choice home accessories in shades similar to Emerald that would be perfect pops of color in a neutral color scheme. 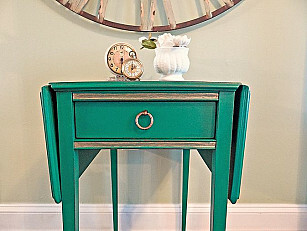 Emerald side table: Not far from Richmond, VA, painter extraordinaire and blogger Kristen from The Modage Cottage painted a simple side table Emerald. Her end table is a splash of color in a neutral color scheme, and looks totally vintage luxe. Pops of Emerald in poster art: John from Young House Love, one of my favorite DIY blogs, recently incorporated Emerald into his grey, neutral sun room by framing and hanging poster art in which Emerald is the only real pop of color. Because the custom carpentry frames and walls of the room are neutral colors, the green graphic on the poster really stands out. Style up a white bathroom with Emerald accessories: If you have an all white bathroom that needs a color punch, three small items in Emerald can style it up. Preserve makes its famous recyclable toothbrushes in a bold kelly green. Your toothbrush can be part of your design scheme! The Company Store, which is known for its high quality cotton and down bedding, has Emerald-ish towels and fluffy bath mats on sale. Go big with a green velvet sofa: Sofa.com is an amazing source for stylish, well-constructed, in-style couches. I bought my couch and arm chair from Sofa.com, and I can vouch for how good-looking and high quality their furniture is. I am not sure how they sell such great furniture for such reasonable prices, but somehow they do. All of their furniture is made to order, and one of the colors of upholstery that they offer is a very rich-looking green velvet. Would you dare to buy an emerald green couch? Dwell Studio Kelly Deco Border Kelly Green Pillow: An Emerald pillow is a conservative way to introduce the color to your living area. Both luxurious and playful, Dwell Studio's Deco Border Kelly Green Pillow is a great example of an Emerald pillow. For more Emerald inspiration, see professional home stager Virtually Staging Properties' post about Pantone's 2013 Color of the Year on Hometalk.com.